I am starting to feed the birds again after a little break. The birds aren't touching the food. How do I know if the seed is still good? One way to check to see if your seed is fresh is to crush some on a piece of paper and see if any oil comes out. When birds are molting, migrating or battling the weather every meal counts, if your seed has dried out your feeder will be skipped. (Wild Birds Unlimited receives a fresh load of seed each week). In the warm months, I wouldn't keep seed longer than a month. In the cool months you can keep seed all winter, no longer. Just as a box of crackers will go stale (even if the bag isn't opened), seed also goes bad. And while we'll survive the occasional dry cracker, birds have high basal metabolic rates & so use energy at high rates. They don't have time to waste on seed without a high oil content. 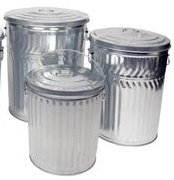 Seed storage cans are an easy way to keep your seed out of reach of rodents. Make sure to leave the seed in their original bags so you are never dumping old seed on top of new. You should also make sure your feeders are clean and there is no mold in the bottom of your feeder. This can be dangerous to the birds. To prevent mold in bad weather use Feeder Fresh™ (a silica grit that absorbs water and humidity, is safe for birds, and made from non-toxic absorbent sand). 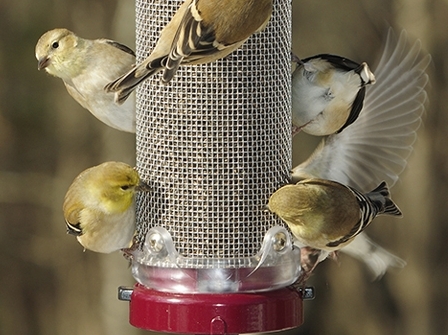 You can also shelter your feeder from the elements by using something like WBU Weather Guard.